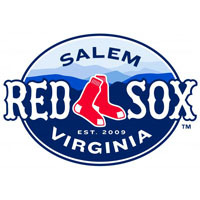 An eight-run sixth inning transformed a 4-1 deficit into a 9-4 lead, and the Salem Sox held on to take the rubber match against Carolina on Sunday afternoon at Five County Stadium. The 9-5 victory became a byproduct of the ridiculous two-out rally, which featured nine straight men reaching base in the top of the sixth inning on five hits and four walks. Lucas LeBlanc’s two-run double gave Salem its first lead at 5-4, and the Sox never looked back in their final road game of the season. Salem finished the year with 14 wins in 20 games against Carolina. Matt Barnes received a no-decision, surrendering four runs on six hits over four innings, striking out three and walking two in his 77 pitch-49 strike performance. Manny Rivera took over in the fifth and earned the win, benefitting from Salem’s eight-run explosion the sixth. Rivera permitted one run on three hits over four frames, improving to 5-5 on the year. Andrew Jones tossed a scoreless ninth to preserve the victory. The Mudcats scratched two runs in the first and one more in the third to surge in front 3-0. The Sox broke through in the top of the fourth with a single run on Carson Blair’s bases loaded walk, but the Mudcats retaliated with Tony Wolters’ two-out RBI double that brought home LeVon Washington and gave Carolina a 4-1 lead. Mudcats reliever JD Reichenbach struck out Michael Almanzar and grounded out Brandon Jacobs to begin the sixth with consecutive outs, but the third out would prove to be elusive. Drew Hedman singled on a 3-2 pitch to prolong the inning, then stole second and third before Sean Coyle’s single drove him in. Coyle stole second before Blair walked, and David Renfroe’s single scored Coyle to make it 4-3. LeBlanc belted a deep fly to the warning track in right-center to score both Blair and Renfroe, reaching second base on his RBI double that gave the Sox their first lead. From there, back-to-back walks loaded the bases. Two runs scored on very wild pitches thrown by Fabio Martinez, and another came home on Jacobs’ RBI double. Hedman finally flew out to end the rally that he began with two outs, ending the streak of consecutive two-out baseunners with Salem in front 9-4. Justin Toole delivered a one-out RBI single in the last of the seventh to bring the Mudcats back within four, but Carolina would not get any closer. Reichenbach suffered the loss, falling to 5-7 on the season. Coyle led the Red Sox with three hits, finishing the three-game series 7-for-13 with six RBI. Jacobs and Hedman also delivered multi-hit games for the Sox, who improved to 64-66-1 on the season. Salem can finish the regular season above .500 by winning five of the final seven games at home this week.